After I had done posts on Chrysler EI - I thought about doing one about HEI systems as well. I can't really add too much about the "nuts & bolts" of doing a conversion, as Dan had done a rather complete write-up on the subject in the Sticky section here. The only things I could mention are: 1) If you have to use "crimp-on" connectors; cut off the plastic insulator sleeves, crimp the terminal hard, use a small bit of solder at the wire-end-to-terminal, & then insulate with heat-shrink tubing 2) When you run wires from the dist pickup to the module, twist them- about one twist per inch. This can make the circuit a little more resistant to electrical interference. It helps to "spin" the wires together as you twist- like you're braiding rope. Now I can go into a "gee-whiz, that's neat" close-up look at how it works, why it's better, & throw in some troubleshooting tips. "Back in the day", I used to see lots of GM HEI systems, but didn't have the tools, training, or time to really get a full understanding of what was going on inside the distributor. It was "hook up the old snap-on ignition scope- Oh, #3 has a burned open wire, #8 is oil-fouled. Replace the parts & get it out the door".Now I've got a kickin' 4 channel DSO, a better grasp of electrical theory- but no more old GM's (thank God??) to test on. I looked aroung my shop & came up with some bits & old spares on the shelf- so I put a HEI together for testing (MacGuyver was my inspiration). It uses a 4-pin "large-cap" (SMP-LX301) module with a generic HEI coil. Now, there isn't anything wrong with Chrysler's EI, but functionally it's the equivalent of maintenance-free breaker points. It is more reliable than points, but doesn't really improve ignition performance at all. NOW GM actually did something right when they designed their High Energy Ignition. They needed it to try & cover up all sorts of driveablilty & emissions problems that their crap engine controls created. You'll want to read my posts here & here to familiarize yourself with EI. In its basic concept, HEI does the same thing as Chrysler EI (C-EI)- an electronic module controls primary current through the coil. However the details are quite different. Chrysler "re-used" the ballast & coil setup from their breaker point system. The module & pickup replaced the points- the module continually charges the coil until triggered by a pulse from the distributor pickup. Since primary power going into the coil is about the same as before, output is essentially unchanged. GM's design was new, using a low resistance coil charged at high amps & volts. It puts alot more power into the coil primary, so it can have higher spark voltage output &/or plug burn duration. Here's an overview waveform that I captured from my HEI at idle. It looks very different from the Chrysler system. HEI has the primary current normally "off" until it receives a pulse from the pickup coil- then it charges & fires the ignition coil. Let's look closer at the primary current & voltage (coil negative). The normal state of primary control is "off", so amps are at 0 & primary (-) voltage is about the same as power supply (+), 14.5V in this case. At point (1) the module switches "on", pulling primary volts down to 500mV & amps start building. When current reaches about 5.7A (+/- 0.2A depending on production tolerances) the module switches to "current limiting mode" at point (2). You can see the limiter voltage pop up & hold at about 11V. So it takes 3-3.5V to flow 5.7A through this coil- plug it into Ohm's law & you get about 0.6 Ohms resistance (my DVOM reads 0.5 static). Then the module is triggered at (3), turning off the primary, letting the built up magnetic field collapse & generating a high voltage spark. 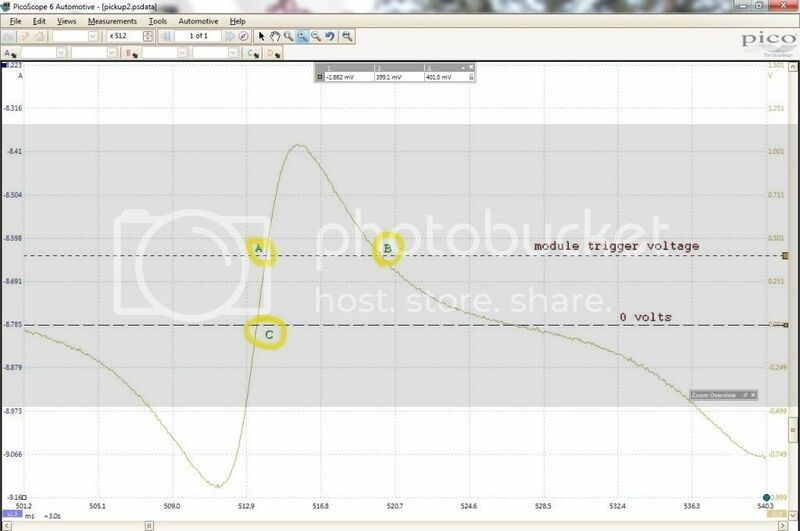 Put 0.6 ohm & a full 14V into Ohm's law again & you have a potential current of over 20A. So why use such a low resistance primary when it's limited to under 6A anyway? You could just use a coil with about 2.4 ohm primary & it would "self limit" at 5.5-6A of current. It's all about time- specifically the amount of time it takes the coil to reach "full charge" of 5.7 amps. Look at the current waveform, it's a straight slope upward, taking about 3.5 milliseconds to hit the amp limit. Compare that with this close-up of C-EI at idle- there the current waveform is a curve that takes 9-10 mSec to reach "full" current (at point 2). At a measly 3500 rpm there isn't enough time to reach full amps before it has to fire the coil (3) then start charging again (1). So the faster you spin it, the less spark output you get- it's worse on a V-8 since it has more cylinders to fire per rev. The lesson is that lower resistance equals faster charging (but more stress on the module). You can also compare the amount of power each system controls for the primary- good ol' (P=VxI) power = volts times amps. Chrysler EI is about 8-8.5V x 3.5A = 25-30W. HEI is 13-14V x 5.7A = 74-80W - that's quite abit more. 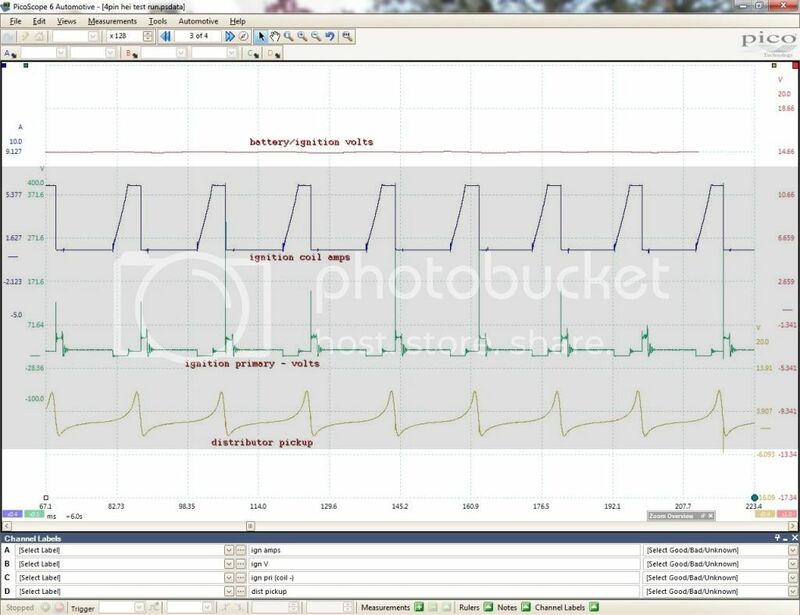 You can see the difference in both C-EI & HEI spark plug burn lines (point 4 on the waveforms). C-EI is 0.7mS while HEI is twice that- 1.4mS (both under similar idle conditions). Then there's the kiloVolt potential. Chrysler system can put out a max of around 25kV- enough to jump a 5/8" gap on my spark tester. HEI does more (& who doesn't like more?) - like around 45kV, jumping a 1-1/8" gap (that's over 28mm kiddies). Now I'm going to go over the distributor pickup, polarity, & triggering. I only covered pickup output voltage in C-EI because most cars either had working systems or the owners were installing stock-type wiring as a retrofit so polarity wasn't (usually) an issue. After looking at the waveforms, I see that both C-EI & HEI use positive polarity, ie. they trigger spark on the negative slope following the positive pickup pulse. Here's a positive pulse waveform. The black pickup wire is connected to terminal G on the HEI module. 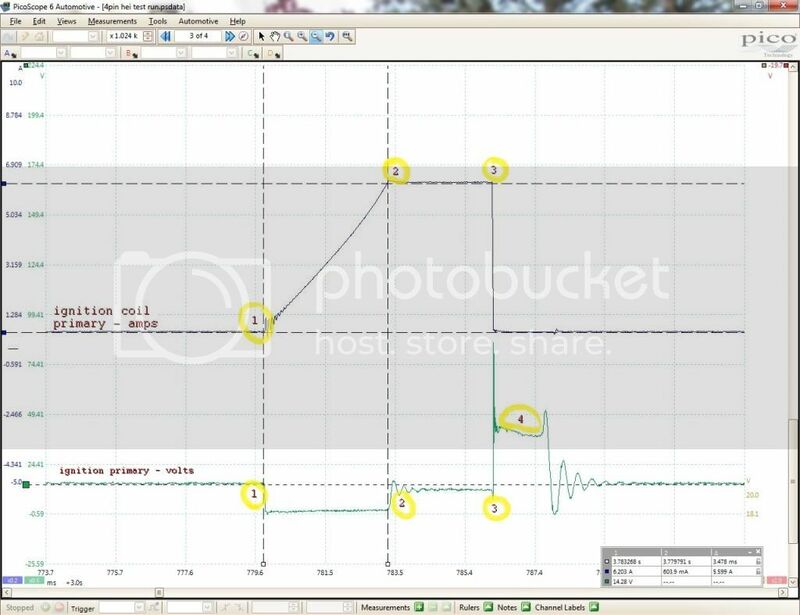 Here is a "positive" polarity waveform of the pickup coil. Chrysler's module seems to trigger very close to the 0V breakover (point C)- this is about where the reluctor tooth is centered on the pickup. GM went a different route (it's fairly clever when you think about it). As the pulse rises (from 0V) to above 300-500mV (A), the HEI module will ground the primary circuit & start charging the coil. 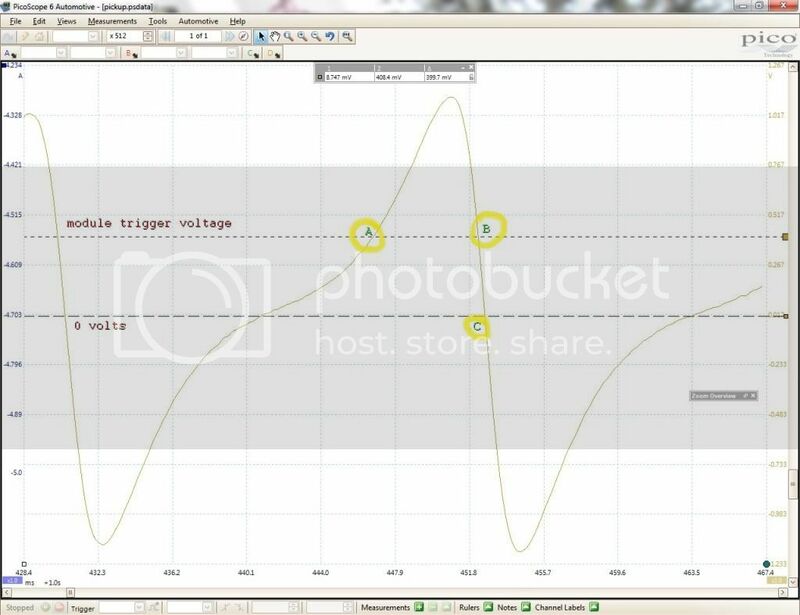 Then the module fires the coil when the pickup voltage falls to the same 300-500mV point on the downslope (B). So the pickup waveform "controls" the dwell time. As rpm's increase, there's less actual time between spark events, but the pickup V amplitude increases (up to a point)- meaning that the waveform rises above the trigger point on the positive slope "earlier" in dist. degrees. It's like a kind of "electrical" centrifugal advance for dwell- there's 7mSec dwell at idle, & still almost 5mSec at 3000. On the downslope for spark trigger, the amplitude change has very little effect- the slope is much steeper & there is less than 100uSec (0.1mSec) variation from idle to 3000 rpm. Someone much smarter than me designed this setup. Here's what happens if the pickup polarity is negative/reversed- black wire going to the W terminal on the module. alignment to the pickup is the same at (C). But the module starts charging on the "first" postive trigger level - (A) roughly the same point in time where it would have fired the coil on positive polarity. The module still fires on the downslope (B)- which now happens 30-50 crankshaft degrees later (retarded). Yes, you could advance the dist. 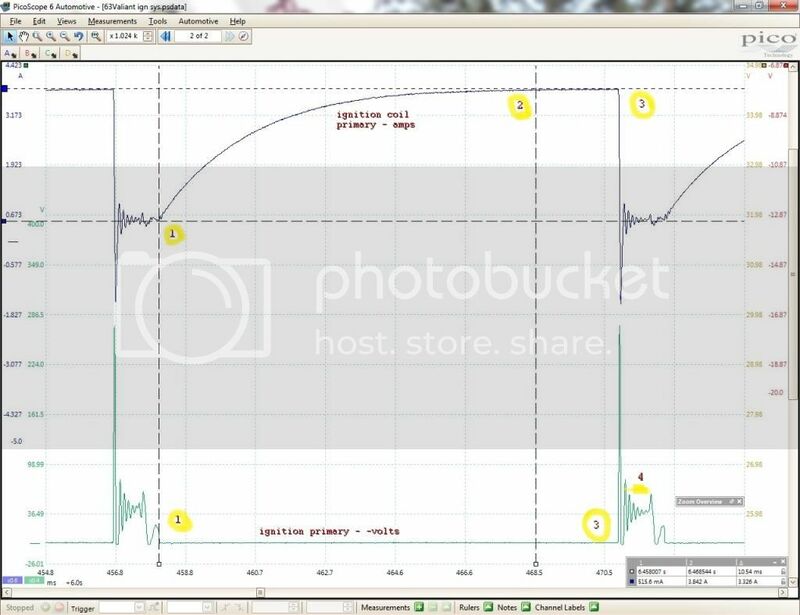 until timing was on "spec", BUT: 1)the rotor tip to dist cap tower relation is all mucked up & at some point the spark will jump to the wrong tower AND 2)the pickup coil waveform increases amplitude with rpm- so now the coil fires even later as the wave gets bigger ("centrifugal" retard). I checked a couple mopar dist, & it seems that the black wire is (+). You can check polarity on your dist- unplug the pickup coil & connect your DVOM leads to it. Set the DVOM to mV DC range. Slowly rotate the dist (CW or CCW doesn't matter). It's much easier with the dist out but you can do it "installed", moving the crank pulley by hand. As a reluctor tooth approaches the pickup you'll see a small reading, say 100mV. If it's +100 then goes -100 as the tooth moves away, then your red lead it on the (+) polarity wire. If it's - then + you're on the (-) wire. When diagnosing HEI the same basic principals apply to testing as C-EI, but some results will be different. The coil & module (+) should be fed full battery power with KOEO or cranking. If it's not within around 500mV or less of batt V with a 10A load on the circuit I would reccomend using a relay to power the ignition circuit per Dan's instructions . There also has to be good grounds; for the module, engine, body, & battery. Since the module is normally "off", coil (-) should read the same as coil (+) when KOEO. When the module charges & fires the coil, volts go down briefly- you see this on a DVOM as a slightly lower average V reading. On my test car, coil (+) was 10.8V cranking, & coil (-) was about 10V. On duty cycle mode, I measured 5-6%. A "better" low-tech method for testing the module is to use a 12V test light. Connect the wire clip to batt (+) or coil (+) & the probe tip to coil (-). Since the module provides a brief ground when it's switching, you'll see the light flicker or glow dimly when the engine cranks (or when you spin your test dist slowly). As dist speed increases the test light will glow brighter. You also might be able to use a (cheap) logic probe to look at the hi/lo switching on coil(-), assuming that the firing spikes don't damage the probe. If it's ok then the red & green led's should alternate. My test coil measured at 0.5 ohms primary & 8.4 kOhms secondary. "specs" are 0.3-2.0 primary, & 6k-20k secondary. All my experience has been with OEM & AM stock replacement type coils. If it's a decent quality part, it should work fine in most all street applications. You can manually test fire a HEI coil- sort of. I was able get some output using the condenser/jumper wire "scratch" test as well as my old points dist BUT, the sparks from the jumper & from the points were both much larger/brighter than the spark I had on my gap-tester at the coil secondary lug. Like C-EI, if you have good; power, ground, coil (-), & pickup signal to the module & it doesn't switch- replace it. If the coil has (+), (-), & the module appears to switch but you don't have spark, either manually test the coil (if you like pretty sparkily light shows) or replace it. I'm not going to say anything about AM "performance" coils as I don't know much about them, other than the buyer should really do their homework concerning proper application & quality/durability before purchase. A side note- I had done some tests on a used OEM 8-pin HEI module as well. The 7 or 8 pin modules function similarly to 4-pin units (mostly) but have additional circuits that allow the engine computer to control ignition timing. Now these units will work in "module" timing mode without a computer BUT they have some "rpm-based" advance built in, I saw 0* at idle & about 12* at 2400. So these modules are good for AM EFI systems like MegaSquirt that can use the timing controls, but otherwise aren't suited for normal HEI conversion. Really shows why the conversion works! 78 NYB (gone now), two S series, three old Snow Cruisers and a Doo. Very, very, very, nice work. I salute you. Always nice when theory is shown to back up the seat-of-the-pants feeling; HEI works! Re. your remarks on the advance in 7/8 pin modules: I mentioned in an earlier thread that I found a variety of HEI modules with built-in advance curves, mostly intended for marine applications, but maybe also for other applications where an engine often run within a limited RPM range for a lenght of time under power. If my memory is correct, they were all ACDelco modules, but there may be aftermarket modules with the same capabilities too. Yes, I am aware of the 'limp home' funcion in the auto modules, but the specific marine modules were strictly intended for use with a distributor with fixed timing, with no provision for mechanical or vacuum-operated adjustment of advance at all. I thought that if such a module with a good timing curve is found, it may be a very attractive - and also low priced - alternative for converting to HEI on a Lean-burn equipped engine, which use a distributor with fixed timing. I also believe that good, second hand, ordinary EI distributors are getting more and more difficult to obtain, and the additional labour and/or cost of a rebuild and recurve may prevent many Lean-burn users from attempting to convert to HEI, as they also will face expences related to the carburetors.